The sacrist, one of the major obedientiaries, was responsible for the general care of the church. He was assisted by a deputy and perhaps other helpers, depending on the size of the community and the scale of his duties. His office, the sacristy, was accessed by a door leading from the presbytery. Much of the sacrist’s work was connected with the church. He opened and closed the doors to the church, ensured that there were sufficient candles and oil, and that there were ashes and palms when necessary. 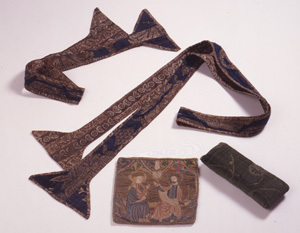 It was his duty to prepare the abbot’s staff and stole when necessary, and to make the hosts for the celebration of Mass. Whenever a novice made his profession as a monk and ceremoniously received the tonsure, it was the sacrist’s job to burn the hair clippings. How did the monks keep the liturgical vestments so clean and smooth? After the service the sacrist rinsed the corporals, veils, towels and altar cloths in separate bowls and then passed the altar cloth to the cellarer to be washed with the rest of the linens. He then washed the others in warm lye-water and dried them; the sacrist then wore albs and smoothed the corporals with a smoothing stone, folded them in three and carefully put them away until next time. The sacrist’s duties extended beyond the church. He was responsible for the lights in the dormitory and cloister, and sounded the bell for all offices and meals. If the sacrist was too early or too late sounding the bell, he had to make amends for this the following day at chapter. The late thirteenth-century account book of Beaulieu Abbey, in Hampshire, offers an interesting insight to the extent of the sacrist’s duties at this time. It reveals that the sacrist of Beaulieu handled sixty-eight gallons of oil which were used in the church, infirmary and dormitory; he received almost all the abbey’s wax from the beehives, additional wax to make candles and wine for the celebration of Mass. He also received incense and a substantial amount of charcoal to burn this, although it may also have been used for heating - to take the chill off the church in winter. (1) Miscellaneous duties pertaining to the sacrist included the purchase of gold and silver leaf, and payments to the painter for work to the High Altar. The sacrist was also responsible for sweeping out the church before feasts when a sermon was given.